Back in January of 2011, I first had the good fortune to review Oliver’s Labels products and I was very, very pleased. Thrilled, in fact, because I discovered that they have a line of kosher kitchen labels that actually STICK. Having wrestled with various brands, I was delighted that not only do these stick strongly to a variety of surfaces (including wooden spoons! ), but they are not see-through, meaning you can see them no matter what colour your implement happens to be. At left is the picture I took of various utensils back then – over a year and a half ago. You can see how useful these would be in distinguishing dairy from meat when the implements are almost identical, like with the pastry brushes (we make turkey pastries often for Shabbos, so we NEED a meat pastry brush!). I just rounded up as many of these as I could find, plus a couple of new ones, to show you how well the labels are bearing up under extremely heavy use. The only times these labels haven’t stuck on well for us is when I’ve attempted to put them on a dirty or uneven surface, like one cutting board that was both chopped up a bit and slightly greasy (doh!). Otherwise, they go on and they STAY on, unlike the leading brands that peel up and leave annoying frayed edges that flap in the breeze. I did try to put one on the cast-iron dutch oven I use to bake bread, but repeated exposure to a 500° left the label adhered but blackened beyond recognition (which was sad, because it’s pareve but also a deep red colour, so it confuses everybody). I also reported at that time that I’d used the labels not just for the kids, but for some of my own stuff – they actually make several more adult-looking label designs, and even plain ones, if you’re planning to do this, but I’m okay with butterflies and squirrels. 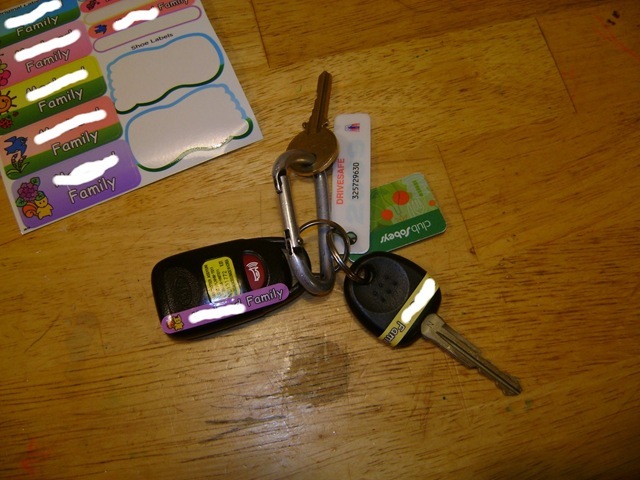 At left is my car key, which sees almost daily use, back in January 2011. And at right, the same labels, clearly taking a licking but definitely still ticking, today. Oliver’s Labels also offer a feature where, instead of your phone number, you can add a special “Found-It” tracking code to any label so that when your items are found, people can go to their website and punch it in rather than getting your personal information directly. This lost-and-found system is totally free with any label purchase. For this review, I requested a sample of the “Stick-EEZ Clothing Labels,” expecting to find a lot of use for them during the summertime what with towels and camp and everything else we go through. However, it seems that these are designed to be stuck onto clothing tags… and so much kids’ clothing doesn’t come with tags anymore that I don’t really know how useful these will be. I do intend to paste a few onto the corners of hankies and see how well they do right on the fabric itself (especially on something like a hankie, which is washed frequently). I desperately hope they don’t come off and jam my washing machine, and I’ll report back once they’ve gone through a few cycles. They are definitely cute! The printing I selected (____ family, and our phone number) came out somewhat microscopic. If you just used a name, it might come out bigger.